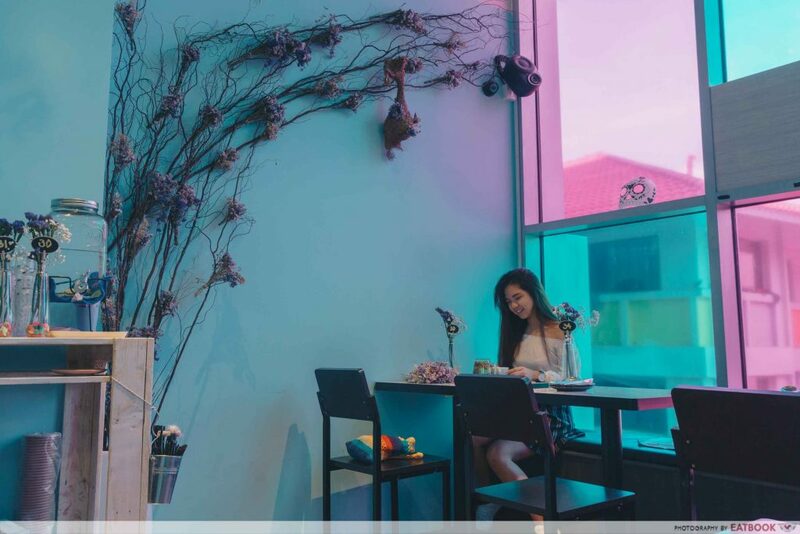 Opened this September, Wild Blooms is a humble two-storey cafe that stands out from other cafes for their aesthetics. 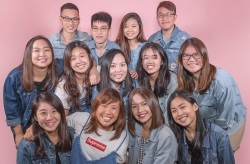 It is Instaworthy AF, with a menu that offers a wide selection of food. 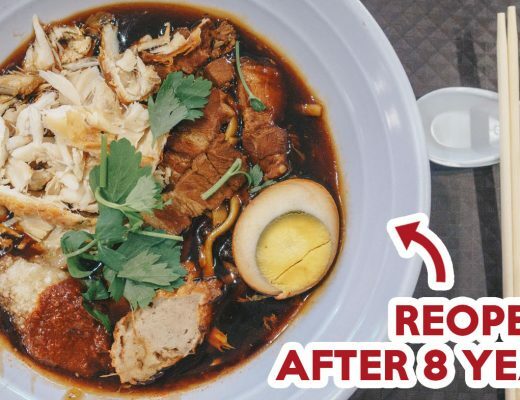 From burgers to pastas, the Western dishes here also incorporate an Asian twist. First up, we went for the Charcoal Wings ($10.90 for half a dozen). 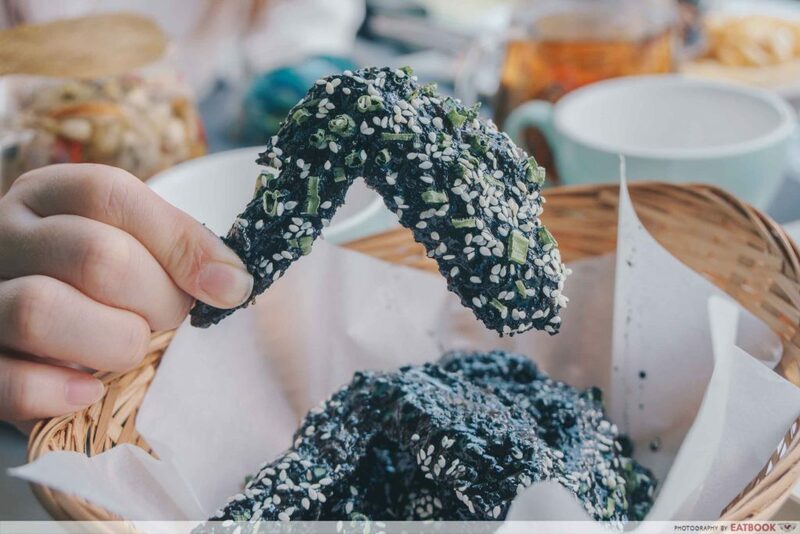 Served in a rustic rattan basket, the jet black wings were coated with a house-made spicy squid ink glaze and topped with sesame seeds and spring onions. 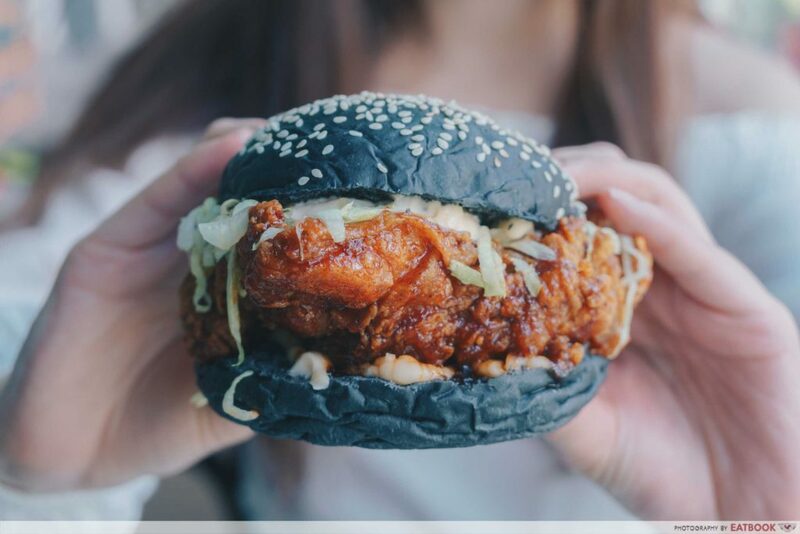 The coating reminded me of the Korean yangnyeom sauce. Slightly sweet yet spicy, these wings had just the right amount of heat. The meat within was tender, and the marinade did not overpower the original taste of the chicken. Be careful not to touch your face or clothes after eating these wings though, as the sticky glaze stains your fingers immediately. 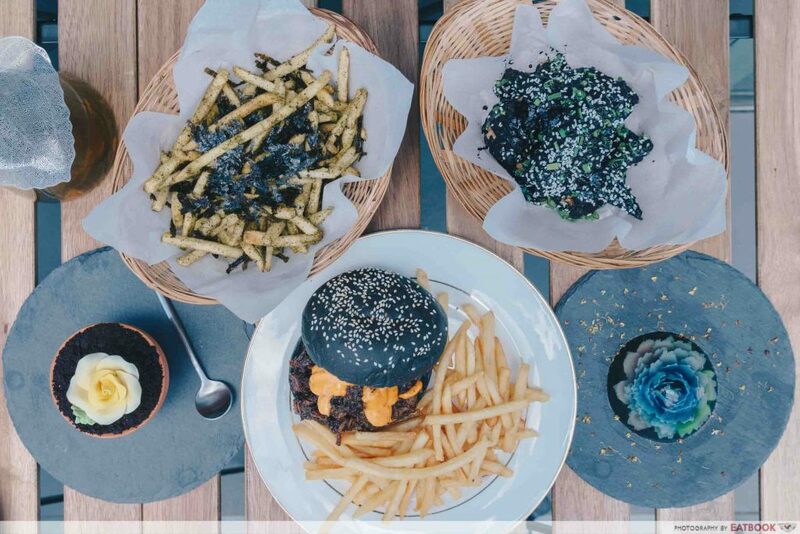 Every order of Wild Blooms’ burgers come with a generous side of fries. For an additional $2, you can upgrade them to Truffle Fries! As we were feeling rather hungry, we decided to give their Korean Spicy Chicken ($13.90) a go. Picking the burger up, I was not expecting the charcoal brioche buns to be so soft and fluffy. They were like holding duck feather pillows, and sunk in when I held them up. Biting into it, the chicken meat was juicy and succulent – a good contrast to the crispy exterior. The sticky sauce is made with gochujang; it is sweet, with a spiciness that slowly builds up with each bite. 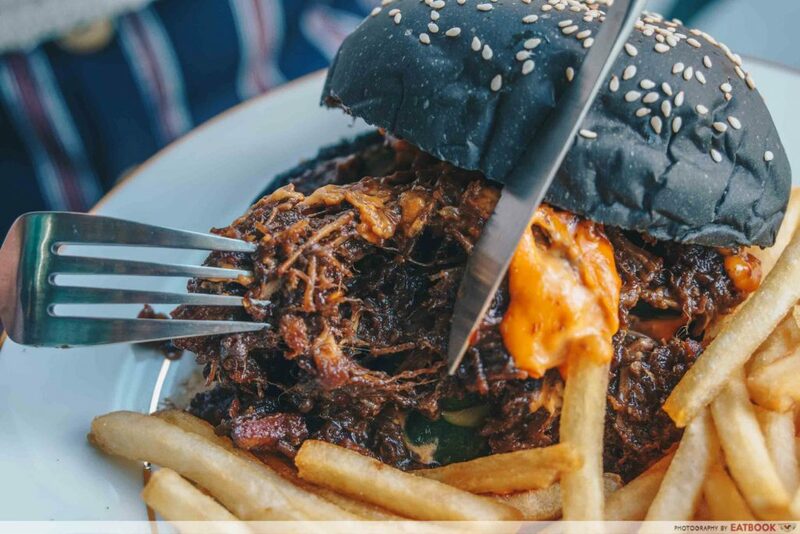 If you prefer a more familiar flavour, go for their Sambal Pulled Pork ($13.90). 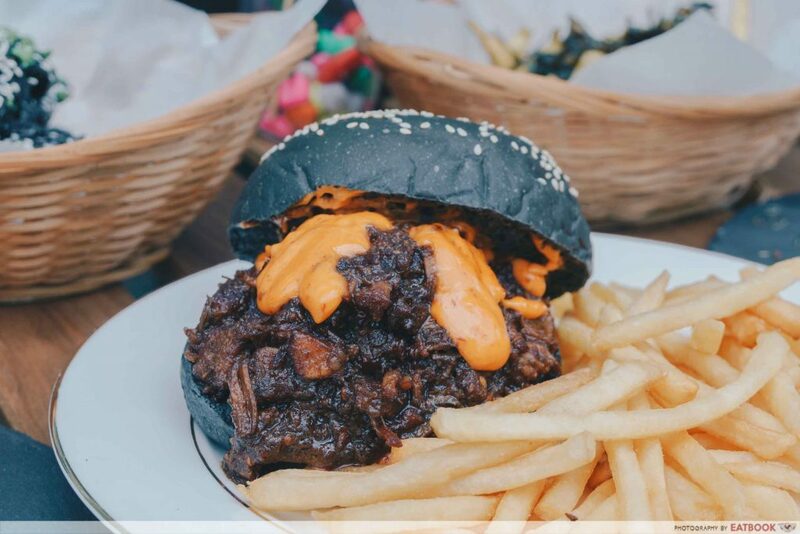 Encased between the same fluffy charcoal buns was a generous portion of pulled pork belly that’s slathered in a spicy sambal mayo sauce. Slow-braised for six hours, the streaky pork was easy to pull apart. I found it a little difficult to pick it up and eat it like a normal burger though, and would recommend diving into it with a fork and knife. The spicy sambal mayonnaise sauce was rich and creamy, complementing the flavours of the pork well. The cucumber slices hidden below the meat added a fresh, crunchy element to dish. This helped cut back on the saltiness of the dish too. 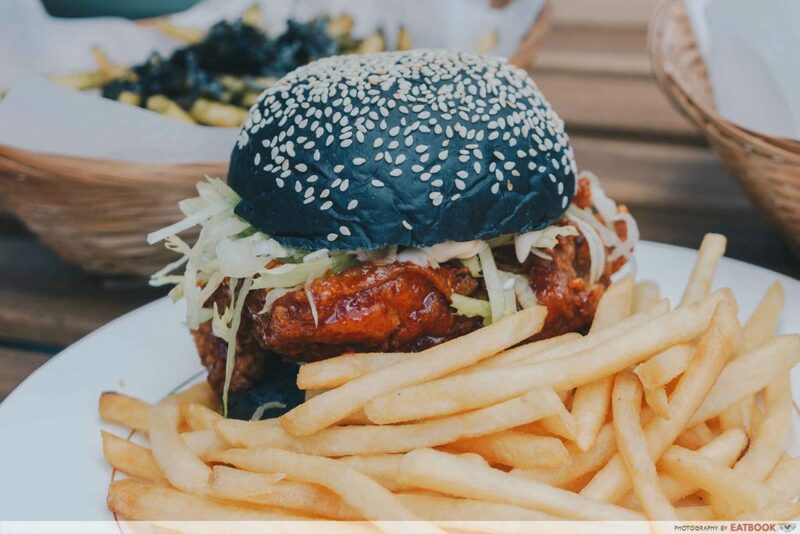 Those expecting a strong sambal taste might be disappointed; I was hoping this burger delivered a more fiery burn to my throat. A lover of all things matcha, I was excited to try the Matcha Seaweed Fries ($8.90). 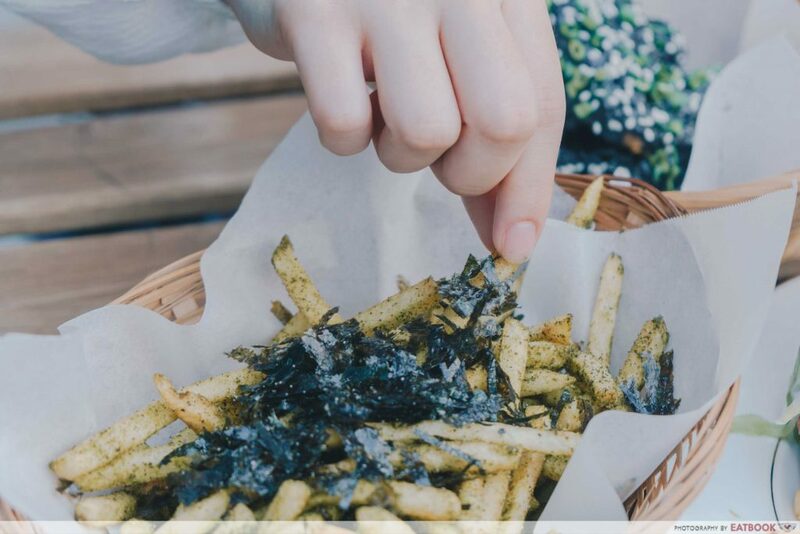 The fries were dusted with matcha and seaweed powder, and topped with nori seaweed. 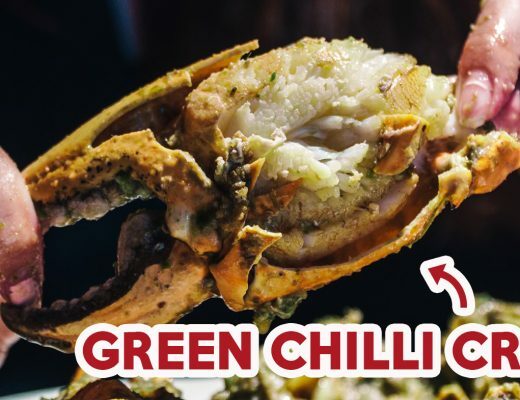 I was expecting a strong hit of matcha, but was left disappointed, as the briny seaweed tang overpowered the tantalising vegetal matcha aroma. To end our meal on a sweet note, we ordered the Flower Tea Jelly Cake ($12.90) by The Utopian Botanist. The level of intricacy and detail put into creating this dish left me lost for words. 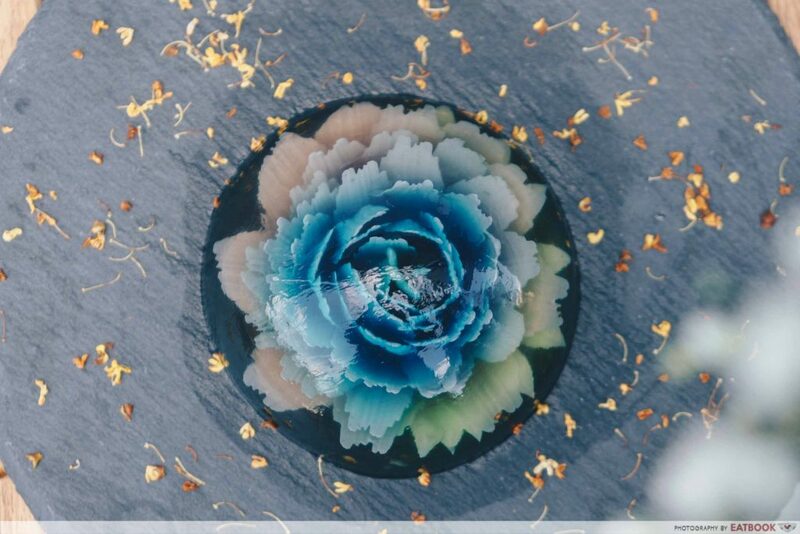 Featuring a blue peony flower, this was an art piece that looked too beautiful to be eaten. The jelly was tough and required some effort to cut into. 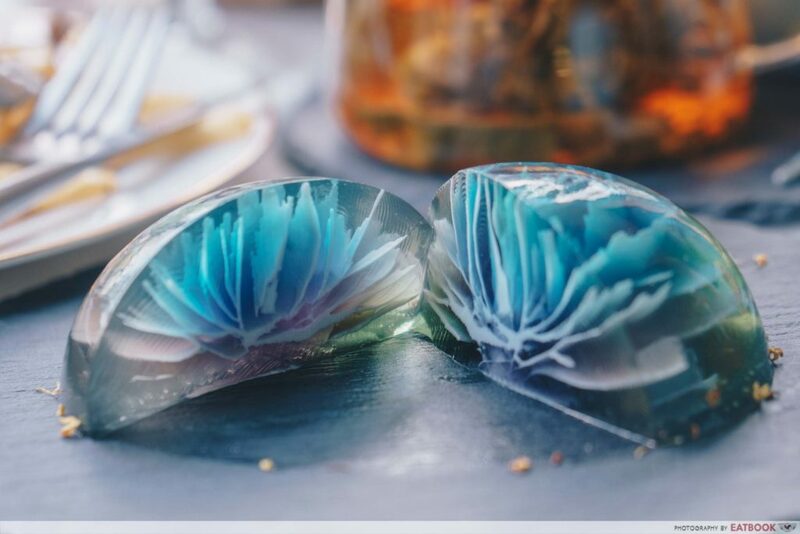 Nonetheless, the jelly itself – made from cold-brewed osmanthus tea – was light and refreshing.The owner sometimes uses chrysanthemum tea as well, depending on the season. 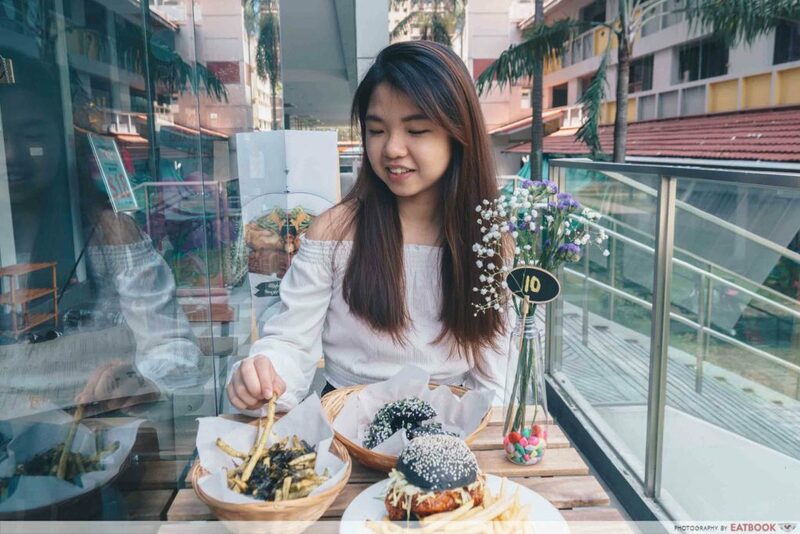 Located a short five-minute walk from Hougang MRT station, Wild Blooms cafe is found at The Midtown. 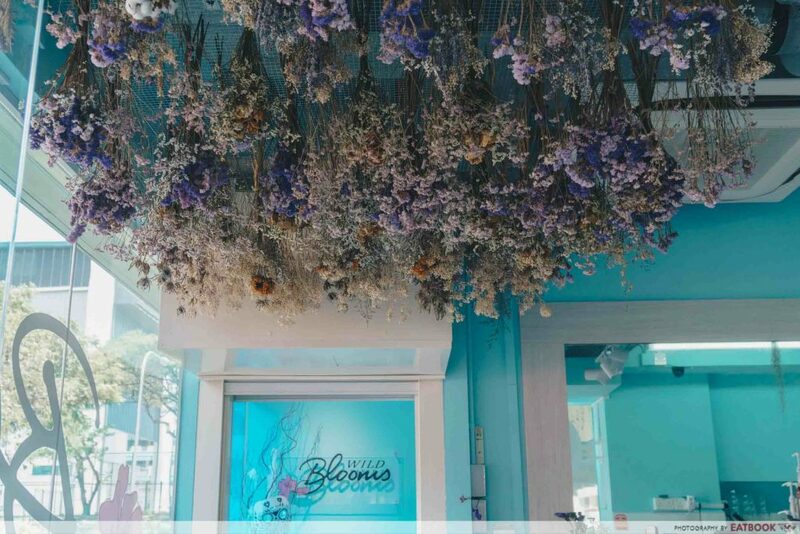 If you look up at the ceiling, you will notice dried flowers hanging as decoration. The owners dehydrate the flowers themselves, and it is really a pretty sight to behold. 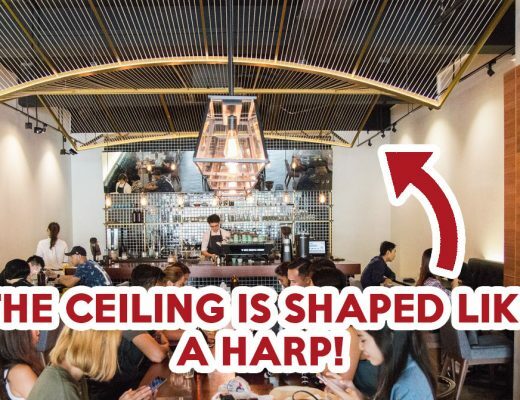 Most of the space for dining is on the second level. The area itself was rather small, but well-spaced enough such that it did not feel cramped up. The windows were tinted turquoise and pink, giving a whimsical greenish hue to the area. Don’t leave without taking a photo in front of the four-metre floral feature wall. The owners created this gorgeous backdrop by painstakingly placing each flower, petal by petal. The decoration changes according to the occasion too. 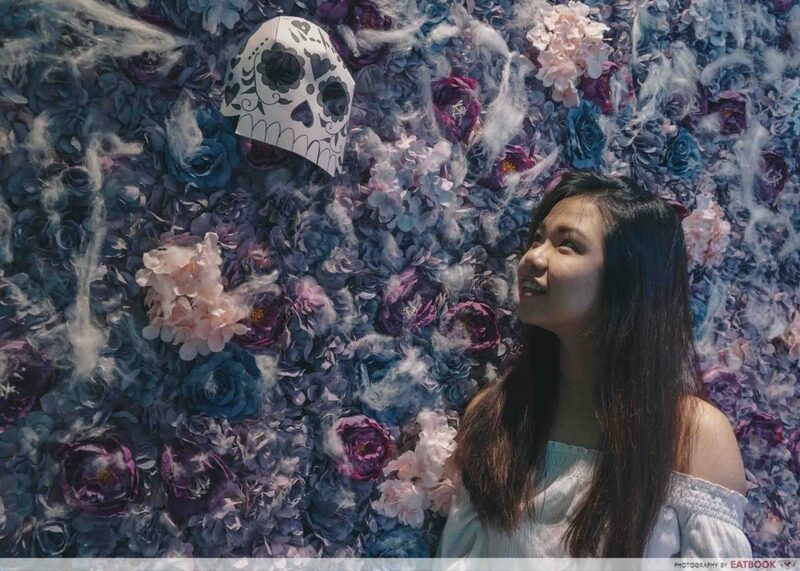 Since we went down during the halloween period, skulls and “spider webs” were scattered on the walls to add a spook-tacular touch! Boasting a floral theme, Wild Blooms Food here is decent and left me feeling satisfied. While I probably won’t come down all the way for the food alone, I recommend giving this place a go if you want to up your Instagram game. Wild Blooms is not halal-certified.